The glacial pace in which things are moving these days is starting to get to me. In my mind, by now, we would be throwing fabulous parties and our house would never be messy (ha!). In my mind, we’d already have a gorgeous kitchen and a working oven. OMG! No more having to bake in a countertop electric convection oven. How great would that be? Well, that’s a question I can’t answer because we’re still using the old kitchen and the old stove is still broken. The room that will house our future guest room is still the dining room, and quite possibly the second most awful room in the house. 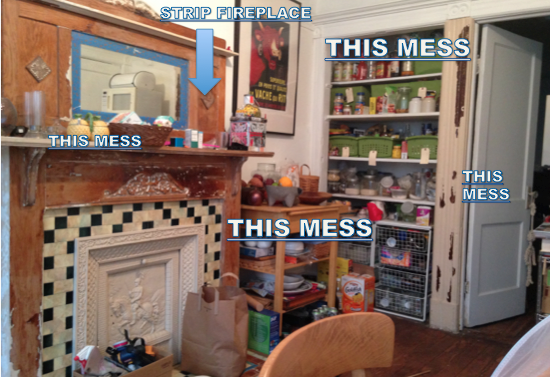 It’s always messy and we spend no time in it – because it’s just terrible. It’s hard to even begin to list everything that is wrong with this room, but let’s try, shall we? This room was never meant to be for this long. This room tries (unsuccessfully) to function as our dining room and pantry, but the only thing it succeeds in is being a catch-all for all sorts of junk. Once we build a new kitchen, this room will become a bedroom. Painfully, it’s becoming quite evident that this will happen sometime it the future, far, far away (probably around the time when the sun runs our of fuel, or when the melting ice caps flood our world – whichever one happens last, because we’re going to need that extra time). With that in mind, it became pittifully obvious that we can’t live with this room one. More. Minute. From the depths of my hopelessness, I decided the sign up for Apartment Therapy’s Style Cure. The fireplace mantel will finally be fully stripped. That half peeling, half painted trim will be dealt with. The pantry will become organized and everything will turn out unicorns and rainbow. Or so I hope – Lordy, this room needs help!